Thorn gently poked Rose’s shoulder. She opened her eyes and saw from the anxious expression on Thorn’s face that there was trouble. Her dream of squabbling Uruk voices was no dream after all. She wiped the sleep from her eyes and came to her feet. Petal was just rousing Arrth. He had done the same as Rose, spread his cloak over a pallet of straw and then lay down to sleep on a bed just marginally softer than the stone floor. They had all gathered close to Rose and were speaking in whispers while planning their strategy. Calyx muttered a word under her breath and gestured at the door. She and Petal and Rose knelt in a row off to one side of the table. A loud click announced that the door wasn’t locked. Arrth lifted his right foot and kicked the door. It slammed open, bumped into someone who was standing too close, and bounced shut again. Arrth pushed the door open again, not so hard. Four uruks in the corridor looked in. They saw Arrth and Thorn. He looked barbaric and mighty, all clad in good steel and leather, with under tusks that jutted up almost to his eyes, skin a dark brownish green. Beside him was a short uruk female warrior holding a Dwarven axe, and wearing what looked like Dwarven armor. 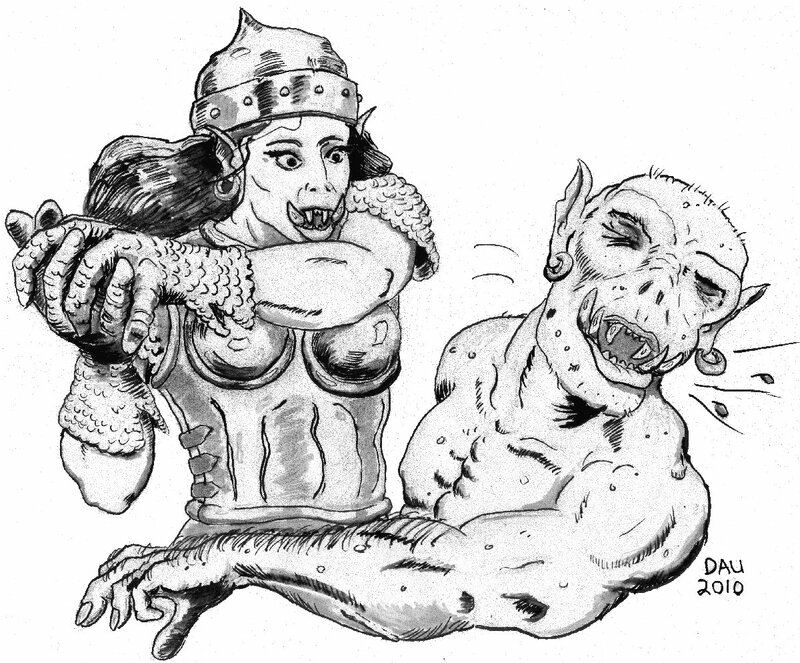 No Dwarf ever had a jaw like that with six jutting fangs, or the fiery red eyes and pointed ears that she displayed. Arrth turned and winked at Rose. He felt certain that she could take one uruk in hand to hand combat. If she couldn’t, well, there would be battle and dead uruks before they ever got to do anything to these women. “Yes, Boss.” She stood up and was a head taller than Ugly. He was the shortest uruk in the group, and not that much uglier than the others, although he did have a broken tusk. With a silly grin on his face, he advanced on her confidently. In a dungeon, one doesn’t take the armor off just because one wants to be comfortable when one sleeps. Rose wore her chain and leather, as did the other “ladies” in the group. Arrth’s group had much better equipment than this ragged bunch of dungeon Uruks. Ugly smiled a nasty smile, then growled. He bared his fangs and roared in Rose’s face. She kicked him in the groin. Hard. Ugly’s growl turned into a gurgle. He clutched himself and doubled forward. Rose brought her mailed fists around in a double-handed blow that struck him with an audible crack of steel on bone that sent him reeling sideways. She followed that with a spinning kick that caught him in the small of the back and knocked him down. Rose did a flying knee drop onto Ugly’s back that smashed him into the floor again. Then she caught his head by the one lock of hair that grew there and banged his face into the stone floor several times. Ugly’s eyes rolled back in his skull, and he lost consciousness. “Urroz, don’t kill him!” Arrth put a little snap into his voice. “Yes, Boss. Sorry. I did not like the way he smiled at me.” Rose stood up, took a couple of steps, glared fiercely at the other three Uruks who were standing by the door with their mouths open, and went back to kneel with Calyx and Petal. Narat couldn’t believe his eyes. His second toughest fighter had just been taken down and whipped silly by a she in less than five seconds. Three very worried uruks hastened to do what she said. The fourth was still unconscious.